Product #1095 | SKU 161MK2B | 0.0 (no ratings yet) Thanks for your rating! 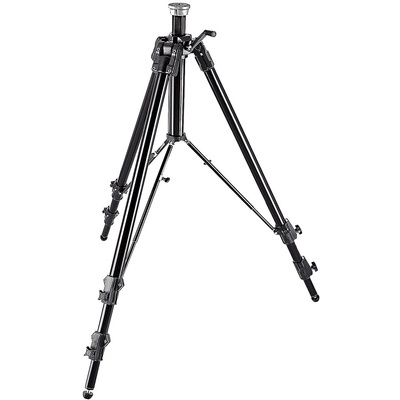 The Manfrotto 161MK2B Super Pro Tripod is the tallest in the Manfrotto line of tripods, and is capable of supporting cameras up to 20kg, at a height of over 2.6 m. It is the ideal large format tripod for home and studio use, and works especially well with the 160 (3057) Professional Head. The 161MK2 offers a working range from a 44 cm minimum to a maximum of 267 cm. The center column is geared for easy, accurate adjustment. This tripod can easily handle an 8x10 view camera even at full height and precarious angles. Replaces old part numbers 3058 & 3258. The built-in mid-level spreader adds anti-torsional rigidity and stops the tripod legs from accidentally being knocked wider apart. Compared to a ground-level spreader or dolly, the mid-level spreader has the advantage that it stays well out of the mud and dirt and is more suitable for use on uneven terrain. The geared center column allows for safe and precise height adjustments. The three set screws in the camera platform can be used to permanently secure the head to the tripod, providing additional security. The twist locks are slightly slower to use than the more common "Quick Action" flip lever leg locks, but give total control over locking force. In addition, they are much easier to service out in the field.